Nice relaxing acoustic melodies are introducing the first full-lenght album of the Colombian Masacre. Which band had important influence on the the very depths of the South American underground scene. The followings are not so calm and chilling, but it's a very interesting album, balancing on the borderline of genres, between catchy melodies to noise, and stepping back and forth from musical structure to chaos. Quite diverse themes and ideas changing each other in that way. Usually it's a death metal band, but like in the case of bands from South America, the style features are not so evident, and including various influences. Mid speed, massive hammering and occasional melodic slow downs changing each other with deep growling that often ends up in insane screaming that reminds to black metal styled vocals. It's a very raw album for sure, but they managed putting together those different influences. This chaotic main view became the main feature of the band's early period. 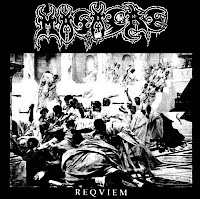 With "Requiem" they gave a new dark shade to the extreme scene.